It was the end of another summer, one filled with commitments, duties, work, responsibility, and not nearly enough hiking, but this weekend had been planned for the last year: The Flags on the 48 (FOT48) event was here again. I consider myself a patriot, and I indirectly know someone who died 9-11-2001, so it's always an easy decision to pay tribute to the thousands of others and the one I so indirectly knew. This year I planned it up big. I invited a number of people to join the expedition up Moosilauke, a mountain that I've never hiked, but so many have raved about. Within 48 hours of the peak registration opening on the FOT48 web site, all but a few were taken. The boys over at flagsonthe48.org did a hell of a job building the event and getting people excited about it. 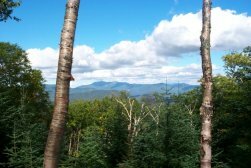 After signing up for Moosilauke, which is fairly far west by 4,000 footer standards, I chose the trail that sounded the most interesting; the Beaver Brook Trail. According to the WMG, the Beaver Brook Trail, although "arduous", followed the Beaver Brook cascades, a beautiful expanse of tumbling water. More on this later. As the event came closer through one reason or another, nearly all of the ten people that had been scheduled to climb the mountain with me backed out. In the end, it was Dome and me along with Kaia and Bailey, now veterans of the FOT48 event. At first I was disappointed that so many people had found other, more important things to do on such an occasion, but then I realized that I was going to post a flag even if I had to go alone. So, after a night at the Wildwood Campground (we were the only ones there! ), Dome and I had a good, energy-filled breakfast and headed out to the trail-head, which was only a mile away. Kaia and Bailey were VERY excited to get going and before long we were unloading the truck. In the parking lot we ran into a group of about ten, hiking in tribute but not as part of our event. Within five minutes, one of them asked what the big PVC pipe was for. We explained it was a flagpole and why we were carrying it. It turned out that one of them was a retired fireman, and he thanked us even before we stepped foot on the trail at 8:45 AM. The Beaver Brook Trail starts out fairly flat, with only a very slight grade. Almost immediately we reached a tricky stream crossing, too deep to just plod across with waterproof boots, but not so bad that we were concerned. In dry weather the stream is probably not as difficult to cross. Another 200 yards along the trail we crossed the stream again, this time on a sturdy bridge. The dogs, of course, just tromped through the water. 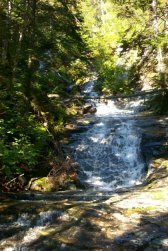 At about � mile, we came to the base of the Beaver Brook Cascades (see pics above) and a sign warning us of our potential doom. We found this funny, albeit a little daunting, but we pressed on anyway. We began our ascent along the cascades following what has to be one of the most beautiful trails I've seen in the Whites. 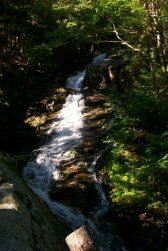 The trail closely follows the Brook, offering constant peeks and some amazing natural noise. This was truly awesome scenery. The trail itself was somewhat less beautiful. The sheer grade is enough to keep many people from taking this route. The numbers say it all: This trail gains almost 2,000 feet in the first mile and a half. That's almost a 45 degree climb. 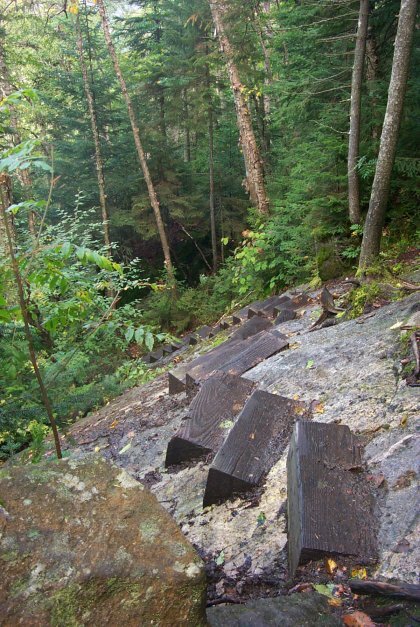 In fact, this route is so steep, that the Dartmouth Outing Club has installed blocks (drilled into the granite) for footholds so hikers can make it up the trail. Kaia and Bailey both had trouble in spots, both dogs showing a little blood on their paws from the effort. This is NOT the trail you want to take Granny on. 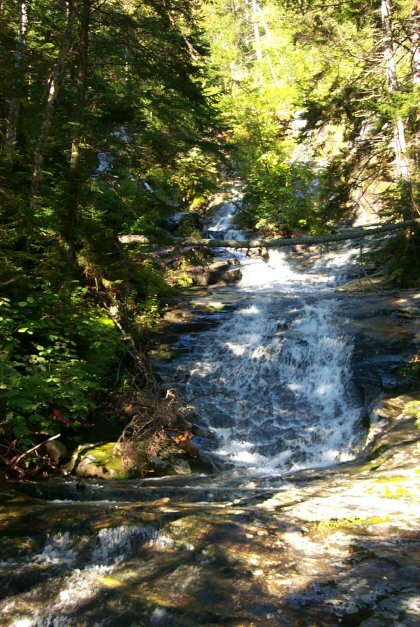 After climbing the Cascades (slowly), the trail breaks away from the Beaver Brook at just over a mile. By 1 � miles we found a sign directing us to the Beaver Brook Shelter, a 20-person lean-to in the back woods. A hiker we passed on the Cascades told us that there were MANY more than 20 people at the site the night before, but that's not surprising considering the number of ignorant people we pass on the trail. 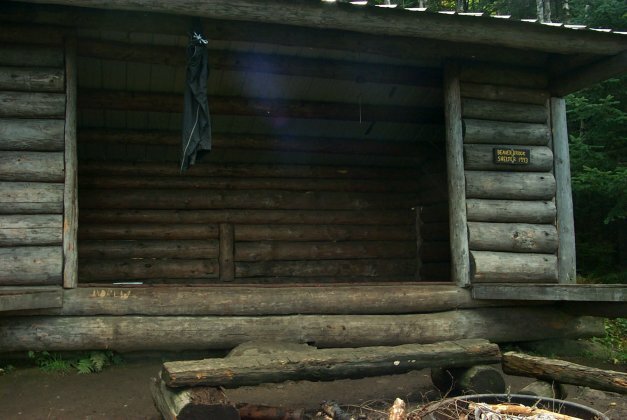 I would like to have seen the look on some of their faces when they came across "Bert's Bath" (the poop-only outhouse near the shelter). We signed the log book at the shelter and snapped a picture of the view, which was worth the stop. Beyond the shelter, the trail levels out a little more, and becomes quite pleasant. Like so many other trails in the WMNF, the Beaver Brook Trail is well maintained, wide enough to pass, and has good footing. 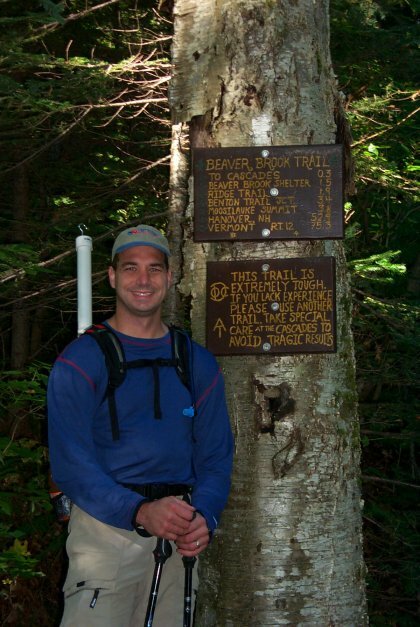 At about 2.5 miles, the trail reaches the outskirts of Mt. 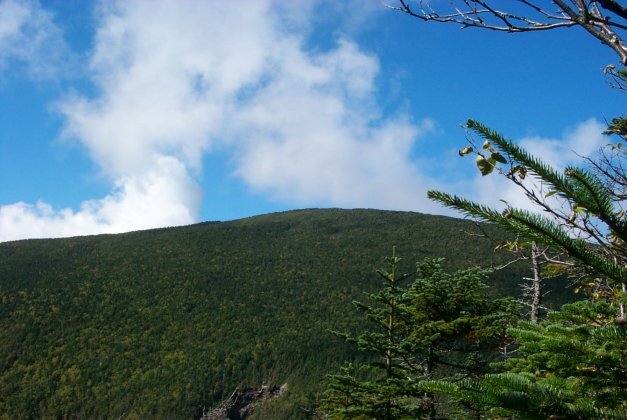 Blue (4529 ft, but not an official 4,000 footer) which can only be summited by bushwhacking. We weren't really up for a challenge at this point, so we pressed on. 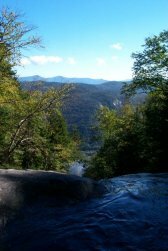 Along the traverse of Blue, there are several excellent views down into the Jobildunk Ravine, although you'd only know that if you read the WMG or this review. We stopped at each view and appreciated that we were out in the woods and not at work. After moving in and out of a couple cols, we began the final ascent to the summit along a moderate grade with good footing. At 3.4 miles the Beaver Brook Trail joins the Benton Trail (our second choice for reaching the summit), and before long we were above tree line and looking at a huge crowd on the summit. By 11:45 we had reached 4,802 feet. 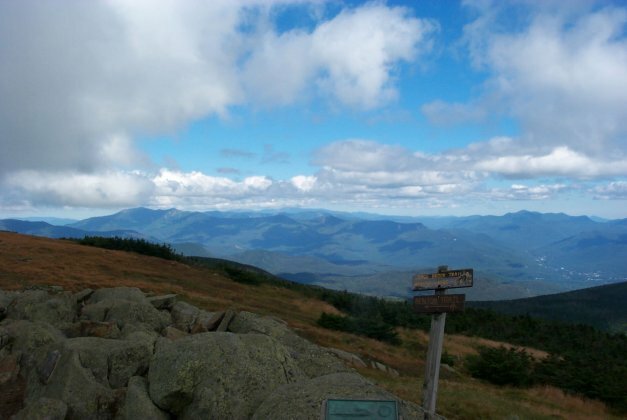 Now, I'm not sure if it was because the date was 9/11/04, but I have only seen one other peak that gets as crowded as Moosilauke was, and people can drive to that summit (or take a cog railway). There were 75 people if there was one! Regardless, Dome and I began to set up the flagpole I had hastily created the night before because we couldn't find our flagpole from last year (big surprise there). We drew quite a crowd and lots of questions. We really enjoyed telling people what we were doing and why we were there, and of course everyone was appreciative of our efforts and the sentiment behind them. While at the summit we met a ton of people, including a 30-member group of the Nashua Mountain Club on their 25th anniversary hike. This was a great group of guys, all very friendly, although quite frankly I'm baffled at how many of them were smoking and sipping beer at the summit! 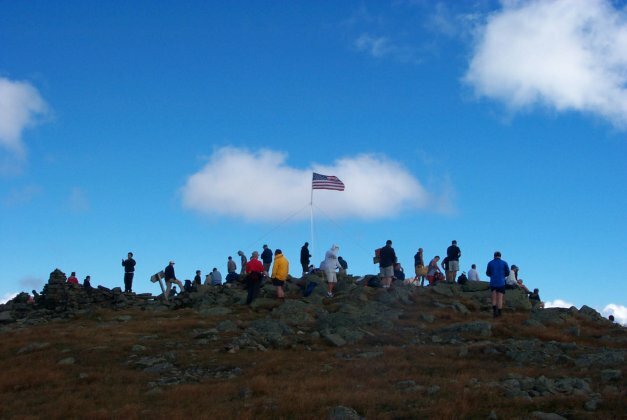 One person informed us that a woman standing at the summit had lost her husband on American Airlines flight 11, and that she made the trip in honor of him. We hoped she appreciated our efforts and intentions, and left it at that. At 2:00 PM we packed up the flag and got ready to head back to the parking lot. Most of the folks had left the summit and there were only (ha! Only!) about 25 people left. The trip back to the parking lot was uneventful, except maybe that going back down the Cascades was even more difficult than going up. Many times Dome had to grab Bailey by the collar and lead him down. Of course, Kaia isn't smart enough to be concerned for her own safety, so she just went head first down ten foot drops like they were nothing. The steepness of the trail makes descent a little slower than more moderate trails, which we didn't think of, and it took us about 2 � hours to get back to the parking lot. But, after it all, we loved the hike and were proud to be a part of the FOT48 again. This is an amazing hike with some of the finest views and features I've ever seen. If you're in good shape, this one is not to be missed, even if just for the Cascades.